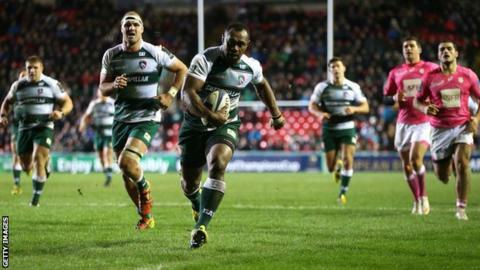 Leicester came from behind to beat Stade Francais in the opening game of the European Rugby Champions Cup. After Peter Betham had a try ruled out for obstruction, the Tigers soon found themselves eight points down. But well-worked tries from Vereniki Goneva and Matt Smith gave the home side a four-point lead at the break. Brendon O'Connor marked his debut by racing clear to score early in the second half and Ben Youngs darted in for a fourth try and a bonus point. Leicester, Cup winners in 2001 and 2002, failed to progress from the group stage of the competition last year but this performance thrilled an enthusiastic crowd of 20,286 on a crisp night at Welford Road. The visitors, who won their domestic Top 14 league in France last term for the first time since 2007, went ahead after finding space on the right flank with some swift interplay. Julien Tomas, on as a replacement for injured former Leicester player Julien Dupuy, went over in the corner and Morne Steyn soon added a penalty from inside his own half. But Leicester produced a superb spell either side of half time that began when O'Connor won possession and the ball was worked wide for Goneva to weave his way to the line. After pressure from the Tigers forwards, Goneva was found on the left again and the wing gave Smith just enough space on the flank to score in the corner. The home side maintained their momentum and O'Connor broke from the halfway line in the opening moments of the second half for the third try. Quick recycling from the French side led to Paul Williams reducing the deficit to five points with a converted try but England scrum-half Youngs, in his first home appearance since the World Cup, breached the visitors' defence after a tap penalty 15 metres out. "I thought we played really well. The set-piece was good and I'm delighted we got the extra point and the fact that we denied them one. "It's a good start but it's going to be tough. Treviso are a good side and hard to beat, certainly at home. We play Munster back to back and also go to Paris. Munster will be key." "I was impressed with Leicester but we gave them a couple of tries, with the knock-on and the penalty they played quickly. "I was proud of the team and the spirit but we have to improve and cut out the stupid mistakes." Replacements: Veainu for Thompstone (69), Bai for O. Williams (76), Harrison for B. Youngs (60), Aguero for Ayerza (69), Crane for O'Connor (65). Not Used: Ghiraldini, Balmain, Slater. Replacements: Raisuge for Arias (72), Nayacalevu for M. Bosman (61), Tomas for Dupuy (16), Zhvania for Panis (67), Slimani for Oleon (41), Flanquart for Pape (57), Ross for Sio (63), Priso for Nicolas (69).